An ice hockey rink is an ice rink that is specifically designed for ice hockey, a team competing sport. Alternatively it is used for other sports such as broomball, ringette and rink bandy. It is rectangular with rounded corners and surrounded by a wall approximately 1 meter (40-48 inches) high called the boards. 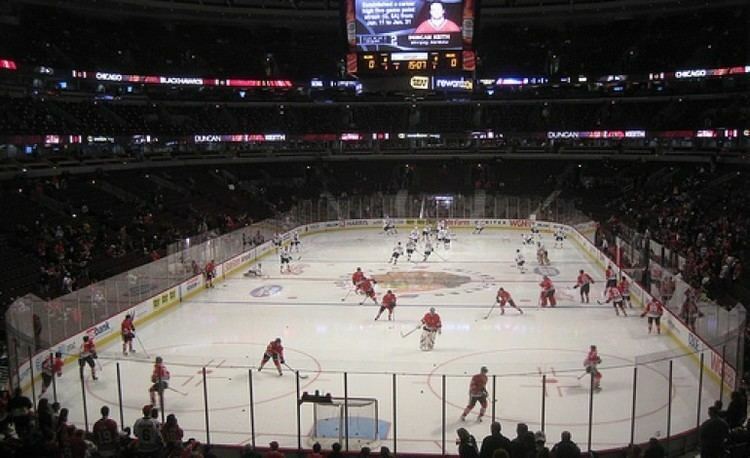 There are two standard sizes for hockey rinks: one used primarily in North America (NHL, AHL, ECHL, etc. ), the other used in the rest of the world (IIHF). The two sizes are known as NHL (for the smaller version used primarily in North America), and Olympic (for international play). 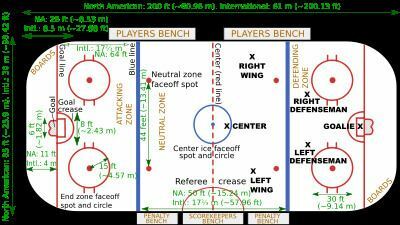 Most North American rinks follow the National Hockey League (NHL) specifications of 200 feet (61 m) × 85 feet (26 m) with a corner radius of 28 feet (8.5 m). The distance from the end boards to the nearest goal line is 11 feet (3.4 m). The NHL attacking zones are expanded, with blue lines 64 feet (20 m) from the goal line and 50 feet (15 m) apart. 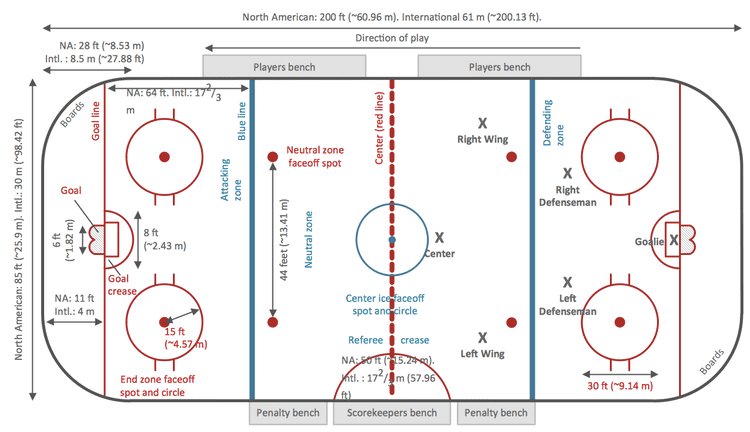 Canadian rinks may vary from NHL ones, especially in the goal crease shape (semi-circular), and in the rink dimensions which can accept widths from 85 to 100 feet. In Finland the rink should be 60 metres (200 ft) long and between 26–30 metres (85–98 ft) wide. 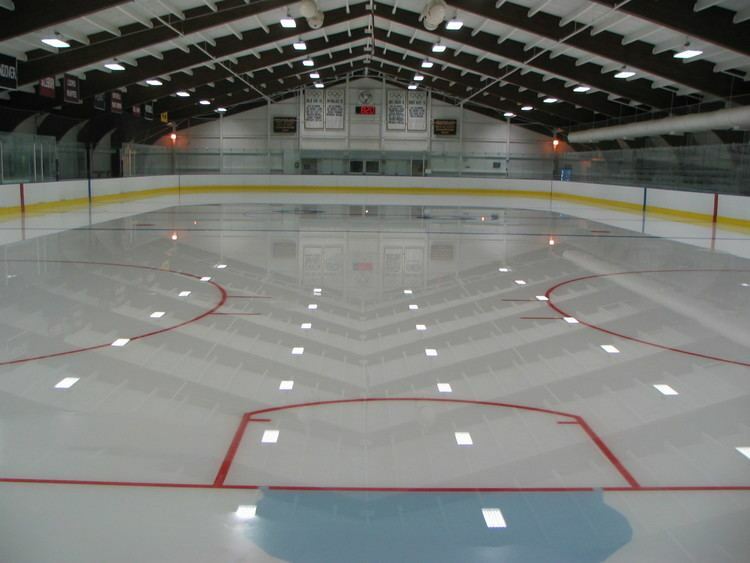 The rink specifications originate from the ice surface of the Victoria Skating Rink in Montreal, constructed in 1862, where the first indoor game was played in 1875. Its ice surface measured 204 feet (62 m) × 80 feet (24 m). The curved corners are considered to originate from the design of the Montreal Arena, also in Montreal, constructed in 1898. The centre line divides the ice in half crosswise. It is used to judge icing, meaning that if a team sends the puck across the centre line (red line), blue line and then across the goal line (that is to say, shoots or dumps the puck past the goal line from behind their own side of the centre line) it is said to be icing. It is a thick line, and in the NHL must "contain regular interval markings of a uniform distinctive design, which will readily distinguish it from the two blue lines." When discussing differences in the rules of the game, it is often said that a game is played with no red line. This simply means that there is no two-line pass violation. The centre line is still used to judge icing violations. There are 9 faceoff spots on a hockey rink. 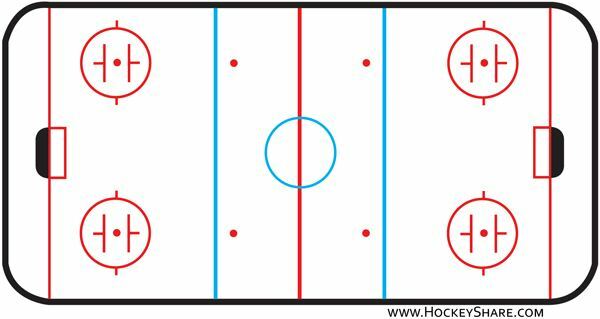 Most faceoffs take place at these spots. 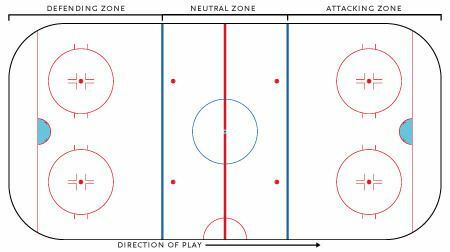 There are two spots in each team's defensive zone, two at each end of the neutral zone, and one in the center of the rink. Both the center faceoff spot and center faceoff circle are blue. The circle is 9 metres (30 ft) in diameter, with an outline 5 centimetres (2.0 in) thick, and the faceoff spot is a solid blue circle 30 centimetres (12 in) in diameter. All of the other faceoff spots and circles are colored red. Each spot consists of a circle 60 centimetres (2.0 ft) in diameter (as measured from the outermost edges) with an outline 5 centimetres (2.0 in) thick. Within the spot, two red vertical lines are drawn three inches (3”) from the left and right inner edges, and the area between these lines is painted red while the rest of the circle is painted white. At each end of the ice, there is a goal consisting of a metal goal frame and cloth net in which each team must place the puck to earn points. According to NHL and IIHF rules, the entire puck must cross the entire goal line in order to be counted as a goal. Under NHL rules, the opening of the goal is 72 inches (180 cm) wide by 48 inches (120 cm) tall, and the footprint of the goal is 40 inches (110 cm) deep. The crease is a special area of the ice designed to allow the goaltender to perform without interference. It is the only large area of the ice painted blue to establish its presence. In most leagues, goals are disallowed if an attacking player enters the goal crease with a stick, skate, or any body part before the puck enters the crease. Goals are also disallowed if an attacking player obstructs the goalie from attempting to make a save. For the purposes of this rule, the crease extends vertically from the painted lines to the top of the goal frame. The rule preventing goals while an attacking player is in the crease was eliminated from the NHL and other North American professional leagues beginning in the 1999–2000 season — however, an NHL skater physically obstructing a goalie's movements within the crease can be called for a "goaltender interference" penalty for such a potential infraction in NHL play. In amateur and international hockey, the goal crease is a half circle with radius of 1.8 m (6 ft). In the NHL and North American professional leagues, this goal crease is truncated along straight lines extending perpendicularly from the goal line 1 ft (30.5 cm) outside each goal post. In the NHL, there are also two red hashmarks 5 centimetres (2.0 in) thick located 4 ft from the goal line that extend 12.5 centimetres (4.9 in) into the crease from either side. During the 2004-05 American Hockey League (AHL) season, an experimental rule was implemented for the first seven weeks of the season, instituting a goaltender trap zone, more commonly called the trapezoid in reference to its shape. Under the rule, it is prohibited for the goaltender to handle the puck anywhere behind the goal line that is not within the trapezoidal area. If they do so they are assessed a minor penalty for delay of game. The motivation for the introduction of the trapezoid was to promote game flow and prolonged offensive attacks by making it more difficult for the goaltender to possess and clear the puck. The rule was aimed at reducing the effectiveness of goaltenders with good puck-handling abilities, most notably Martin Brodeur and Marty Turco. The area consists of a centred, symmetrical trapezoid. The bases of the trapezoid are formed by the goal line and the end boards. The base on the goal line measures 6.71 metres (22.0 ft) — widened from the original 5.5 metres (18 ft) for the 2014-15 NHL season onwards — and the base along the end boards measures 8.5 metres (28 ft), with the depth behind the goal line-to-boards distance specified at 3.35 metres (11.0 ft). The referee's crease is a semicircle ten feet in radius in front of the scorekeepers bench. Under USA Hockey rule 601(d)(5), any player entering or remaining in the referee's crease while the referee is reporting to or consulting with any game official may be assessed a misconduct penalty. The USA Hockey casebook specifically states that the imposition of such a penalty would be unusual, and the player would typically first be asked to leave the referee's crease before the imposition of the penalty. The NHL has a similar rule, also calling for a misconduct penalty. Traditionally, captains and alternate captains are the only players allowed to approach the referee's crease. In a hockey rink, the boards are the sides of the rink. The "side boards" are the boards along the two long sides of the rink. The half boards are the boards halfway between the goal line and blue line. The sections of the rink located behind each goal are called the "end boards." The boards that are curved (near the ends of the rink) are called the "corner boards." It is a popular misconception that the half boards are the entire section of boards on the sides of the rink. Upright bars located at the ends of the team benches.